This article is about the contemporary demographics of Africans. For historical information, see List of ethnic groups of Africa. The population of Africa has grown rapidly over the past century and consequently shows a large youth bulge, further reinforced by a low life expectancy of below 50 years in some African countries. Total population as of 2017 is estimated at more than 1.25 billion, with a growth rate of more than 2.5% p.a. The most populous African country is Nigeria with 191 million inhabitants as of 2017 and a growth rate of 2.6% p.a. 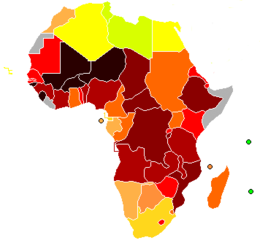 Map of Africa indicating Human Development Index (2004). Most African countries have annual population growth rates above 2%. As of 2016[update], the total population of Africa is estimated at 1.225 billion, representing 17% of the world's population. According to UN estimates, the population of Africa may reach 2.5 billion by 2050 (about 26% of the world's total) and nearly 4.5 billion by 2100 (about 40% of the world's total). The population of Africa first surpassed one billion in 2009, with a doubling time of 27 years (growth rate 2.6% p.a.). Population growth has continued at almost the same pace, and total population is expected to surpass 2 billion by 2038 (doubling time 29 years, 2.4% p.a.). The reason for the uncontrolled population growth since the mid 20th century is the decrease of infant mortality and general increase of life expectancy without a corresponding reduction in fertility rate, due to a very limited use of contraceptives. Uncontrolled population growth threatens to overwhelm infrastructure development and crippling economic development. Kenya and Zambia are pursuing programs to promote family planning in an attempt to curb growth rates. The extreme population growth in Africa is driven by East Africa, Middle Africa and West Africa, which regions are projected to more than quintuple their populations over the 21st century. The most extreme of these is Middle Africa, with an estimated population increase by 680%, from less than 100 million in 2000 to more than 750 million in 2100 (more than half of this figure is driven by the Democratic Republic of the Congo, projected to increase from 47 million in 2000 to 379 million in 2100). Projected population growth is less extreme in Southern Africa and North Africa, which are expected, respectively, to not quite double and triple their populations over the same period. World map indicating infant mortality rates per 1000 births in 2006. In September 1987, UNICEF and the World Health Organization (WHO) Regional Committee announced the launching of the Bamako Initiative— chartered in response to financial issues occurring in the region during the 1980s, and with the aim of increasing access to vital medications through community involvement in revolving drug funds. The 1987 Bamako Initiative conference, organized by the WHO was held in Bamako, the capital of Mali, and helped reshape the health policy of sub-Saharan Africa. The meeting was attended by African Ministers of Health who advocated for improvement of healthcare access through the revitalization of primary healthcare. The new strategy substantially increased accessibility through community-based healthcare reform, resulting in more efficient and equitable provision of services. The public health community within the region raised issues in response to the initiative, of which included: equity, access, affordability, integration issues, relative importance given to medications, management, dependency, logistics, and sustainability. As a result of these critiques, the Initiative later transformed to address the increase of accessibility of health services, the enhancement of quality of health services, and the overall improvement of health system management. A comprehensive approach strategy was extended to all areas of health care, with subsequent improvement in the health care indicators and improvement in health care efficiency and cost. The sub-Saharan African region experiences disproportionate rates of infectious and chronic diseases in comparison to other global regions. Type 2 diabetes persists as an epidemic in the region posing a public health and socioeconomic crisis for sub-Saharan Africa. Scarcity of data for pathogenesis and subtypes for diabetes in sub-Saharan African communities has led to gaps in documenting epidemiology for the disease. High rates of undiagnosed diabetes in many countries leaves individuals at a high risk of chronic health complications, thus, posing a high risk of diabetes-related morbidity and mortality in the region. In 2011, sub-Saharan Africa was home to 69% of all people living with HIV/AIDS worldwide. In response, a number of initiatives have been launched to educate the public on HIV/AIDS. Among these are combination prevention programmes, considered to be the most effective initiative, the abstinence, be faithful, use a condom campaign, and the Desmond Tutu HIV Foundation's outreach programs. According to a 2013 special report issued by the Joint United Nations Programme on HIV/AIDS (UNAIDS), the number of HIV positive people in Africa receiving anti-retroviral treatment in 2012 was over seven times the number receiving treatment in 2005, with an almost 1 million added in the last year alone. The number of AIDS-related deaths in sub-Saharan Africa in 2011 was 33 percent less than the number in 2005. The number of new HIV infections in sub-Saharan Africa in 2011 was 25 percent less than the number in 2001. Malaria is an endemic illness in sub-Saharan Africa, where the majority of malaria cases and deaths worldwide occur. Studies show that more than half of the world’s maternal deaths occur in sub-Saharan Africa. However, progress has been made in this area, as maternal mortality rates have decreased for multiple countries in the region by about half since 1990. Additionally, the African Union in July 2003 ratified the Maputo Protocol, which pledges to prohibit female genital mutilation(FGM). The sub-Saharan African region alone accounts for about 45% of global infant and child mortalities. Studies have shown a relationship between infant survival and the education of mothers, as years of education positively correlate with infant survival rates. Geographic location is also a factor, as child mortality rates are higher in rural areas in comparison to urban regions. Routine immunization has been introduced to countries within sub-Saharan Africa in order to prevent measles outbreaks within the region. Neglected tropical diseases such as hookworm infection encompass some of the most common health conditions which affect an estimated 500 million individuals in the sub-Saharan African region. Results of Global Burden of Disease studies reveal that the age-standardized death rates of non-communicable diseases in at least four sub-Saharan countries including South Africa, Democratic Republic of Congo, Nigeria, and Ethiopia supersede that of identified high-income countries. Improvement in statistics systems and increase in epidemiological studies with in-depth analysis of disease risk factors could improve the understanding of non-communicable diseases (i.e. : diabetes, hypertension, cancer, cardiovascular disease, obesity, etc.) in sub-Saharan Africa as well as better inform decisions surrounding healthcare policy in the region. Onchocerciasis ("river blindness"), a common cause of blindness, is also endemic to parts of the region. More than 99% of people affected by the illness worldwide live in 31 countries therein. In response, the African Programme for Onchocerciasis Control (APOC) was launched in 1995 with the aim of controlling the disease. Tuberculosis is a leading cause of morbidity and mortality on a global scale, especially in high HIV-prevalent populations in the sub-Saharan African region, with a high case fatality rate. A shortage of health professionals compounded by migration of health workers from sub-Saharan Africa to other parts of the world (namely English-speaking nations such as the United States and the United Kingdom) has negatively impacted productivity and efficacy of the region’s health systems. More than 85% of individuals in Africa use traditional medicine as an alternative to often expensive allopathic medical health care and costly pharmaceutical products. The Organization of African Unity (OAU) Heads of State and Government declared the 2000s decade as the African Decade on African Traditional Medicine in an effort to promote The WHO African Region’s adopted resolution for institutionalizing traditional medicine in health care systems across the continent. Public policy makers in the region are challenged with consideration of the importance of traditional/indigenous health systems and whether their coexistence with the modern medical and health sub-sector would improve the equitability and accessibility of health care distribution, the health status of populations, and the social-economic development of nations within sub-Saharan Africa. Map of Africa colored according to the percentage of the adult (ages 15–49) population with HIV/AIDS. Life expectancy has fallen drastically in Southern Africa a result of HIV/AIDS. Speakers of Bantu languages (part of the Niger–Congo family) predominate in southern, central and southeast Africa. The Bantu farmers from West Africa's inland savanna progressively expanded over most of Africa. But there are also several Nilotic groups in South Sudan and East Africa, the mixed Swahili people on the Swahili Coast, and a few remaining indigenous Khoisan (San and Khoikhoi) and Pygmy peoples in southern and central Africa, respectively. Bantu-speaking Africans also predominate in Gabon and Equatorial Guinea, and are found in parts of southern Cameroon. 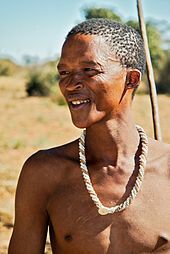 In the Kalahari Desert of Southern Africa, the distinct people known as the "San" have long been present. Together with the Khoikhoi, they form the Khoisan. The San are the pre-Bantu indigenous people of southern Africa, while Pygmies are the pre-Bantu indigenous African peoples of Central Africa. The peoples of West Africa primarily speak Niger–Congo languages belonging mostly, though not exclusively, to its non-Bantu branches, though some Nilo-Saharan and Afroasiatic-speaking groups are also found. The Niger–Congo-speaking Yoruba, Igbo, Fulani, Akan and Wolof ethnic groups are the largest and most influential. In the central Sahara, Mandinka or Mande groups are most significant. 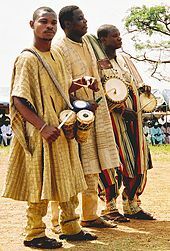 Chadic-speaking groups, including the Hausa, are found in the more northerly parts of the region nearest to the Sahara and Nilo-Saharan communities such as the Kanuri, Zarma and Songhai are present in eastern parts of West Africa bordering Central Africa. The peoples of North Africa comprise three main groups: Berbers in the northwest, Egyptians and Libyans in northeast, and Nilo-Saharan-speaking peoples in the east. The Muslim settlers who arrived in the 7th century introduced the Arabic language and Islam to the region, initiating a process of linguistic Arabization of the region's inhabitants. The Semitic Phoenicians (who founded Carthage) and Hyksos, the Indo-Iranian Alans, the Indo-European Greeks, Romans and Vandals settled in North Africa as well. Berber-speaking populations still make significant communities within Morocco and Algeria and are still also present in smaller numbers in Tunisia and Libya. The Berber-speaking Tuareg and other often-nomadic peoples are the principal inhabitants of the Saharan interior of North Africa. In Mauritania, there is a small Berber community and Niger–Congo-speaking peoples in the South, though in both regions Arabic and Arab culture predominates. 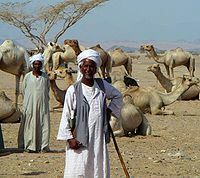 In Sudan, although Arabic and Arab culture predominates, it is also inhabited by originally Nilo-Saharan-speaking groups such as the Nubians, Fur, Masalit and Zaghawa who over the centuries have variously intermixed with migrants from the Arabian peninsula. Small communities of Afro-Asiatic-speaking Beja nomads can also be found in Egypt and Sudan. In the Horn of Africa, Afro-Asiatic-speaking groups predominate. Ethiopian and Eritrean groups like the Amhara and Tigrayans (collectively known as Habesha) speak languages from the Semitic branch of Afro-Asiatic language family, while the Oromo and Somali speak languages from the Cushitic branch of Afro-Asiatic. In southern Ethiopia and Eritrea, Nilotic peoples related to those in South Sudan are also found, while Bantu and Khoisan ethnic minorities inhabit parts of southern Somalia. An Afrikaner family from South Africa, 1886. Prior to the decolonization movements of the post-World War II era, Europeans were represented in every part of Africa. Decolonisation during the 1960s and 1970s often resulted in the mass emigration of European-descended settlers out of Africa – especially from Algeria and Morocco (1.6 million pieds-noirs in North Africa), Kenya, Congo, Rhodesia, Mozambique and Angola. By the end of 1977, more than one million Portuguese were thought to have returned from Africa. Nevertheless, White Africans remain a minority in many African states, particularly South Africa, Zimbabwe, Namibia and Réunion. The African country with the largest native European African population is South Africa. The Afrikaners, the British diaspora and the Coloureds are the largest native European-descended groups in Africa today. Native European colonization also brought sizable groups of Asians, particularly people from the Indian subcontinent, to British colonies. Large Indian communities are found in South Africa, and smaller ones are present in Kenya, Tanzania, and some other southern and East African countries. The large Indian community in Uganda was expelled by the dictator Idi Amin in 1972, though many have since returned. The islands in the Indian Ocean are also populated primarily by people of Asian origin, often mixed with Africans and Europeans. The Malagasy people of Madagascar are Austronesian people and native African people, but those along the coast are generally mixed with Bantu, Arab, Indian and European origins. Malay and Indian ancestries are also important components in the group of people known in South Africa as Cape Coloureds (people with origins in two or more races and continents). Beginning with the 21st century many Hispanics, primarily Mexicans, Central Americans, Chileans, Peruvians, and Colombians, have immigrated to Africa. Around 500,000 Hispanics have immigrated to Africa, most of whom live in South Africa, Kenya, Nigeria, Uganda, and Ghana. During the 20th century, small but economically important communities of Lebanese and Chinese have also developed in the larger coastal cities of West and East Africa, respectively. There are three major linguistic phyla native to Africa: Niger–Congo languages (including Bantu) in West, Central, Southeast and Southern Africa; Nilo-Saharan languages (unity debated) spoken from Tanzania to Sudan and from Chad to Mali; Khoisan languages (probably no phylogenetic unit, see Khoe languages), concentrated in the Kalahari Desert of Namibia and Botswana; There are several other small families and language isolates, as well as languages that have yet to be classified. In addition, the Afroasiatic languages are spread throughout Western Asia, North Africa, the Horn of Africa and parts of the Sahel. The Afroasiatic homeland may be either in Western Asia or in Africa. More recently introduced to Africa are Austronesian languages spoken in Madagascar, as well as Indo-European languages spoken in South Africa and Namibia (Afrikaans, English, German), which were used as lingua francas in former European colonies. Around a hundred languages are widely used for inter-ethnic communication. Arabic, Somali, Berber, Amharic, Oromo, Igbo, Swahili, Hausa, Manding, Fulani and Yoruba are spoken by tens of millions of people. Twelve dialect clusters (which may group up to a hundred linguistic varieties) are spoken by 75 percent, and fifteen by 85 percent, of Africans as a first or additional language. Niger–Congo is the largest phylum of African languages, with more than 500 million speakers (2017); it is dominated by the Bantu branch, spread throughout sub-Saharan Africa in the Bantu expansion, Bantu speakers accounting for about half of Niger–Congo speakers. Arabic is the most widely spoken single language in Africa by far, with a population of Arab Africa of the order of 330 million (2017). Other Afroasiatic languages are spoken by of the order of 100 million speakers in Africa (2017). Nilo-Saharan are spoken by of the order of 100 million speakers (2017). Khoisan groups a number of mostly endangered click languages, the largest being Khoekhoe with of the order of 300,000 speakers (2016). Wikimedia Commons has media related to Demographics of Africa. ^ a b c d e "World Population Prospects - Population Division - United Nations". esa.un.org. Retrieved 29 November 2017. ^ Eliya Zulu, "How to defuse sub-Saharan Africa’s population bomb", New Scientist, 26 April 2012. Jeffrey Gutman and Nirav Patel, "Urban Africa: Avoiding the perfect storm", Foresight Africa, 26 January 2018. ^ Joseph J Bish, "Population growth in Africa: grasping the scale of the challenge", The Guardian, 11 January 2016. "African fertility has not fallen as expected. Precipitous declines in fertility in Asia and Latin America, from five children per woman in the 1970s to around 2.5 today, led many to believe Africa would follow a similar course. [...] Unfortunately, since the early 1990s, family planning programmes in Africa have not had the same attention [as in other parts of the world], resulting in slow, sometimes negligible, fertility declines. In a handful of countries, previous declines have stalled altogether and are reversing. [...] A few heroic efforts, such as Family Planning 2020, are attempting to stimulate family planning programmes across the continent, and there are some signs of success. Recent figures from Kenya and Zambia show substantial strengthening of contraceptive use among married women. In Kenya, 58% of married women now use modern contraception, and in Zambia this measure has risen from 33% to 45% in the last three years. In both cases, the catalysts for improvements were government commitment and commensurate budget financing. The virtuous circle may not be completely out of reach, but many more African governments must make haste and make substantial investments in contraceptive information and access for their people." ^ "World Health Statistics 2016: Monitoring health for the SDGs Annex B: tables of health statistics by country, WHO region and globally" (PDF). World Health Organization. 2016. Retrieved 3 August 2018. ^ United Nations Department of Economic and Social Affairs (29 July 2015). "United Nations World Population Prospects: 2015 revision" (PDF). UN. Retrieved 3 August 2018. ^ "Falkland Islands (Islas Malvinas) Life expectancy at birth". Index Mundi. Retrieved 3 August 2018. ^ "Greenland Life expectancy at birth". Index Mundi. Archived from the original on 2016. Retrieved 3 August 2018. ^ a b c d Hanson, Kara; McPake, Barbara (1993). "The Bamako Initiative: where is it going". Health Policy and Planning. Oxford University Press. 8: 267–274. CiteSeerX 10.1.1.878.4969. ^ a b Ridde, Valéry (2011). "Is the Bamako Initiative Still Relevant for West African Health Systems?" (PDF). International Journal of Health Services. Baywood Publishing Co., Inc. 41 (1): 175–184. doi:10.2190/HS.41.1.l. PMID 21319728 – via Google Scholar. ^ "Health Systems Resource Guide: user fees". 28 November 2006. Retrieved 10 May 2018. ^ Knippenberg, R.; Alihonou, E.; Soucat, A.; Oyegbite, K.; Calivis, M.; Hopwood, I.; Niimi, R.; Diallo, M. P.; Conde, M. (June 1997). "Implementation of the Bamako Initiative: strategies in Benin and Guinea". The International Journal of Health Planning and Management. 12 Suppl 1: S29–47. doi:10.1002/(SICI)1099-1751(199706)12:1+3.0.CO;2-U (inactive 5 March 2019). ISSN 0749-6753. PMID 10173105. ^ "Medicus Mundi Switzerland - Manageable Bamako Initiative schemes". 8 October 2007. Retrieved 10 May 2018. ^ a b c Dalal, Shona; Beunza, Juan Jose; Volmink, Jimmy; Adebamowo, Clement; Bajunirwe, Francis; Njelekela, Marina; Mozaffarian, Dariush; Fawzi, Wafaie; Willett, Walter (1 August 2011). "Non-communicable diseases in sub-Saharan Africa: what we know now". International Journal of Epidemiology. 40 (4): 885–901. doi:10.1093/ije/dyr050. ISSN 0300-5771. PMID 21527446. ^ Mbanya, Jean Claude N; Motala, Ayesha A; Sobngwi, Eugene; Assah, Felix K; Enoru, Sostanie T (26 June 2010). "Diabetes in sub-Saharan Africa". The Lancet. 375 (9733): 2254–2266. doi:10.1016/s0140-6736(10)60550-8. ISSN 0140-6736. PMID 20609971. ^ UNAIDS. "Global Fact Sheet: World AIDS Day 2012" (PDF). UNAIDS.org. ^ "Desmond Tutu HIV Foundation - Our Work". 16 January 2013. Retrieved 10 May 2018. ^ "UNAIDS reports more than 7 million people now on HIV treatment across Africa––with nearly 1 million added in the last year—while new HIV infections and deaths from AIDS continue to fall". www.unaids.org. Retrieved 10 May 2018. ^ UN Joint Programme on HIV/AIDS (UNAIDS) (May 2013). "UNAIDS Special Report Update: How Africa Turned AIDS Around" (PDF). ^ "Fact sheet about Malaria". World Health Organization. Retrieved 10 May 2018. ^ Alvarez, Jose Luis; Gil, Ruth; Hernández, Valentín; Gil, Angel (14 December 2009). "Factors associated with maternal mortality in sub-Saharan Africa: an ecological study". BMC Public Health. 9: 462. doi:10.1186/1471-2458-9-462. PMC 2801510. PMID 20003411. ^ a b "Maternal mortality". World Health Organization. Retrieved 10 May 2018. ^ Bonino, Emma (15 September 2004). "A brutal custom : Join forces to banish the mutilation of women". The New York Times. ISSN 0362-4331. Retrieved 10 May 2018. ^ Verguet, Stéphane; Jassat, Waasila; Hedberg, Calle; Tollman, Stephen; Jamison, Dean T.; Hofman, Karen J. (21 February 2012). "Measles control in Sub-Saharan Africa: South Africa as a case study". Vaccine. 30 (9): 1594–1600. doi:10.1016/j.vaccine.2011.12.123. ISSN 1873-2518. PMID 22230581. ^ Hotez, Peter J.; Kamath, Aruna (25 August 2009). "Neglected Tropical Diseases in Sub-Saharan Africa: Review of Their Prevalence, Distribution, and Disease Burden". PLOS Neglected Tropical Diseases. 3 (8): e412. doi:10.1371/journal.pntd.0000412. PMC 2727001. PMID 19707588. ^ a b "Onchocerciasis (river blindness)". World Health Organization. Retrieved 10 May 2018. ^ Mukadi, Ya Diul; Maher, Dermot; Harries, Anthony (26 January 2001). "Tuberculosis case fatality rates in high HIV prevalence populations in sub-Saharan Africa". AIDS. 15 (2): 143–52. doi:10.1097/00002030-200101260-00002. ISSN 0269-9370. PMID 11216921. ^ Canagarajah, Sudharshan; Ye, Xiao (1 April 2001). "Public Health and Education Spending in Ghana in 1992-98: Issues of Equity and Efficiency". SSRN 632648. ^ Naicker, Saraladevi; Plange-Rhule, Jacob; Tutt, Roger C.; Eastwood, John B. (2009). "Shortage of healthcare workers in developing countries--Africa". Ethnicity & Disease. 19 (1 Suppl 1): S1–60–4. ISSN 1049-510X. PMID 19484878. ^ Kofi-Tsekpo, Mawuli (2004). "Institutionalization of African traditional medicine in health care systems in Africa". African Journal of Health Sciences. 11 (1–2): i–ii. ISSN 1022-9272. PMID 17298111. ^ Dunlop, David W. (November 1975). "Alternatives to "modern" health delivery systems in Africa: Public policy issues of traditional health systems". Social Science & Medicine. 9 (11–12): 581–586. doi:10.1016/0037-7856(75)90171-7. ISSN 0037-7856. ^ "Prevalence of HIV, total (% of population ages 15-49) | Data". data.worldbank.org. Retrieved 9 May 2018. ^ "BBC News | Health | Life expectancy in Africa plummets due to Aids". news.bbc.co.uk. Retrieved 9 May 2018. ^ Pygmies struggle to survive in war zone where abuse is routine. Times Online. 16 December 2004. ^ Q&A: The Berbers. BBC News. 12 March 2004. ^ "China and Africa: Stronger Economic Ties Mean More Migration". By Malia Politzer, Migration Information Source. August 2008. ^ Epstein, Edmund L.; Kole, Robert, eds. (1998). The Language of African Literature. Africa World Press. p. ix. ISBN 978-0-86543-534-6. Retrieved 23 June 2011. Africa is incredibly rich in language—over 3,000 indigenous languages by some counts, and many creoles, pidgins, and lingua francas.